Changes are happening for Aikido Olympia. If you find yourself downtown looking at the unassuming storefront situated on Columbia Street between Hannah’s Bar and Grill and The Estate Store, you probably won’t notice those differences. On weekday evenings, you will still see adults and children alike practicing the modern martial art, rolling across the mats and working together on throws that look as much like dance moves as methods of self-defense. You won’t see any changes on the practice mats. The changes happening at Aikido Olympia are mere formalities, paperwork designations that will recognize Aikido Olympia as a non-profit organization. Aikido is a modern martial art, developed in Japan by Morihei Ueshiba in the mid-twentieth century. Aikido of Olympia is the result of the collective efforts of many individuals over the years who started it at the Evergreen State College in 1971 and brought it to its present location in 2007, currently under the direction of Jim West Sensei (6th dan Aikido). 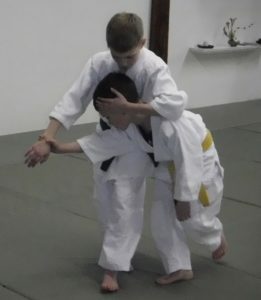 Unlike most martial arts, which could be considered having an offensive focus, relying on punches and kicks, Aikido is more of a defensive art which focuses on redirecting the opponent’s attacks. As Aikido instructor Brandon Henkins Sensei explains, most Aikido moves take initiation from the partner (the uke) in practice, or the aggressor in a real life scenario. The focus is not on besting the opponent, but resolving the conflict. Aikido Olympia is different than other martial art studios in other ways as well. Like most martial arts dojos, members pay fees, both annual and monthly. Unlike most martial arts studios, those fees are not used to employ instructors or staff. Aikido Olympia is run solely by volunteers whose goal is to share the practice of Aikido with the community. 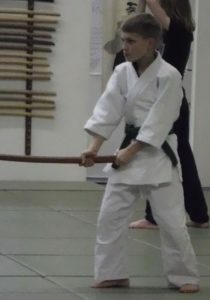 The fees collected by Aikido Olympia are used to pay rent, insurance, utilities and other dojo expenses like purchasing mats and training equipment. Occasional dojo work parties allow members to come together to perform periodic cleaning to keep the dojo in peak condition for training, and often provide an opportunity for members to socialize. Members of Aikido Olympia come together to interact with each other and the public in a number of ways. Following quarterly testing, where students demonstrate their knowledge of Aikido skills in order to advance in the art, members come together for a “snackluck”, a casual potluck where members eat with each other, socialize and celebrate the efforts of the testers and their partners. For a number of years, Aikido Olympia has regularly participated in Arts Walk. It also offers a community Aikido workshop open to the public the 3rd Saturday of the month. Aikido Olympia hopes to expand their commitment to the community as they make plans to offer an Aikido for Seniors class at the Olympia Senior Center sometimes in the future. A dedication towards the betterment of the community led leaders within Aikido Olympia to initiate the transition to a non-profit organization. Aikido Olympia recently received a letter from the State of Washington officially recognizing the organization as a non-profit. While they await federal approval, members of Aikido Olympia are on the lookout for new relationships and opportunities to be involved within the community. Aikido Olympia is located at 506 Columbia Street SW in downtown Olympia. Adult classes are offered for beginners on Monday and Wednesday, starting at 6:00 p.m. Youth classes are offered on Tuesday and Thursday beginning at 5:30 p.m. A variety of other classes, such as advanced Aikido and Bell Misogi, a practice of breathing and mind training, are available throughout the week. Please see the Aikido Olympia Website for additional schedule times and to learn more.